I'm not sure why I'm so fascinated by little houses but I am. This book about them is a beauty. This is not a how-to manual. You'll have to look elsewhere for blueprints. this is more of a dream book. It shows lot of tiny houses, all under 500 sq ft. It has detailed photographs of interiors and the descriptions of many of these houses are written by the builders themselves. They tell how they were inspired to build, what techniques they used, how it's working for them, etc. It is full of inspiration. These range from houses built out of scrap material to high-end homes but they are all under 500 sq ft. Buildings from all around the world are found here and a number of them aren't full time houses. 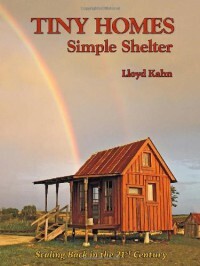 Some of them are weekend cottages or workspaces or buildings just used as a bedroom. They even show the Capsule Hotel in Tokyo. A number of the companies that manufacture these homes are features also. It's fun to read. If I have any complaints about the book it's that at times the tone from some of the builders gets a little self-righteous. Sorry, you're not going to guilt me into leaving my big ol'1905 Victorian but I sure do love to look at the pretty little houses. Book received from Netgalley in exchange for an honest review.